In 2011 Pelikan introduced the Edelstein series of high-end inks, available in a variety of colours. The theme of the Edelstein concept is the gemstone - each ink corresponds to the beautiful colour of a gem. The Edelstein line of inks is presented in 50 ml high-value bottles, that are truly beautiful, and worthy of a place on your desk. In this review I take a closer look at Olivine, the Edelstein Ink of the Year 2018. This is a limited edition ink, that could be gone in the near future, although it's not unheard of for Pelikan to change its mind. Be sure to check out lapis's review for an excellent and highly detailed discussion and comparison with other greens. To clear the field: Olivine is not the kind of green that people anticipated based on the pre-release pictures and the images of the mineral circulating on the web (see the thread in lapis's review for a thorough discussion of this aspect). This review will totally ignore this topic, and simply evaluate the ink on its own merit. Olivine is a dark green ink, with very visible blue undertones. I wouldn't go so far as calling it a teal ... the green clearly dominates. But the blue undertones do give it a certain complexity that is quite apparent when writing or drawing. The chromatography of this ink shows a complex mix of dyes, clearly indicating the bright blue undertones hidden within the ink. The result is a very fine writing ink, that can handle all nib ranges without a problem. The ink has excellent contrast with the paper, even when using EF nibs. 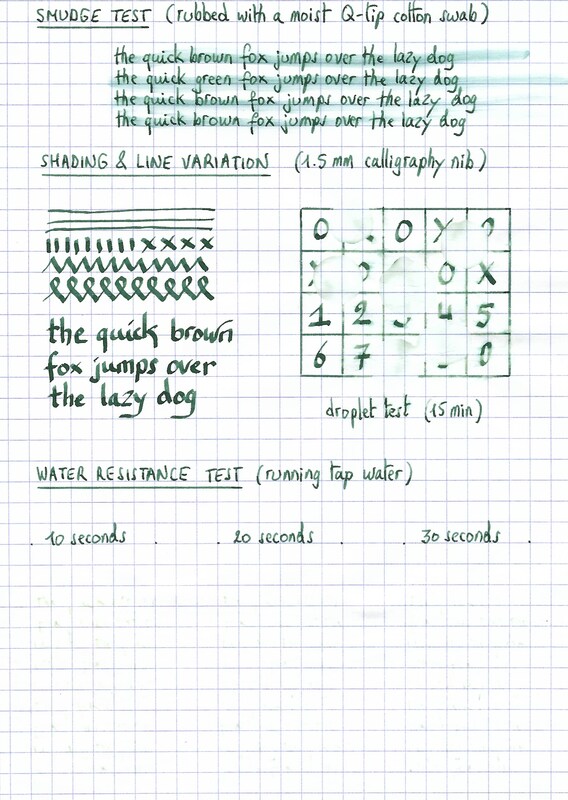 Olivine also shows of some impressive but still elegant shading, which even shows up in finer nib sizes. Well executed! Overall, I really like what I see on the paper. To show you the impact of saturation on the ink's look & feel on paper, I made some scribbles where I really saturated portions of the paper with ink. This gives you a good idea of what Olivine is capable of in terms of colour range. The ink shows quite some variation between light and darker parts. This probably explains why it's such a good shader. Technically, the ink behaved perfectly, with exceptionally good flow and saturation, and a good contrast with the paper even in the finer nibs. Overall a pleasurable ink to write with. Drying times are quite reasonable in the 10 second range with M-nibs. Olivine copes well with a wide variety of paper - and can even tolerate the crappy ones. Only on Moleskine, the ink looks sickly and pale, and has noticeable feathering and bleed-through. 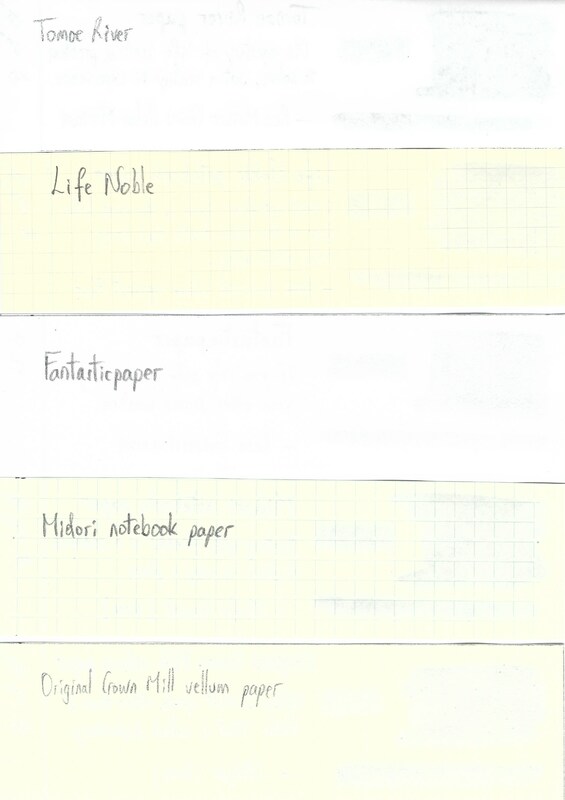 On other papers the ink behaved impeccably, looking good on both white and more yellowish paper. Unfortunately, Olivine shows a total lack of water resistance. Even the slightest touch of water obliterates your writing - see the water test at the end of this review. As such, I don't consider this an ink you can use in the workplace. I've put myself a challenge to try to produce interesting drawings using only the ink I'm reviewing. I find this to be a fun extension of the hobby, and have found these single-ink drawings ideal for experimenting with different techniques. 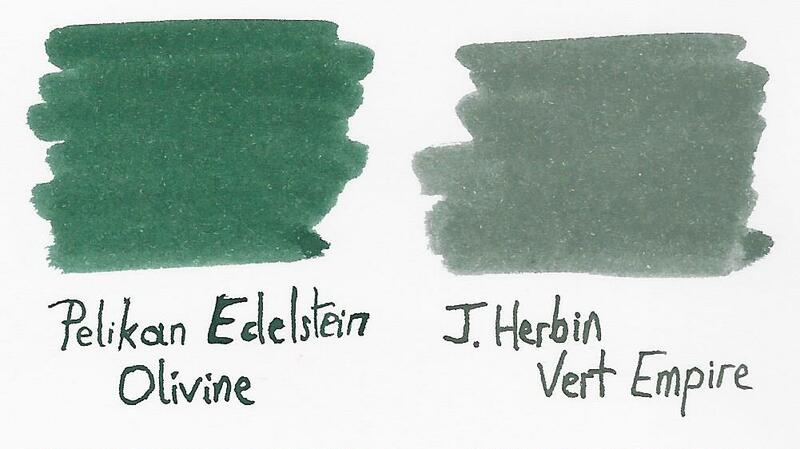 When using Olivine for drawing, the complexity and colour range of the ink can be used to great effect. For this drawing I used 300 gsm rough watercolour paper. For the sky, I diluted the ink with lots of water, which brings forth the blue undertones. 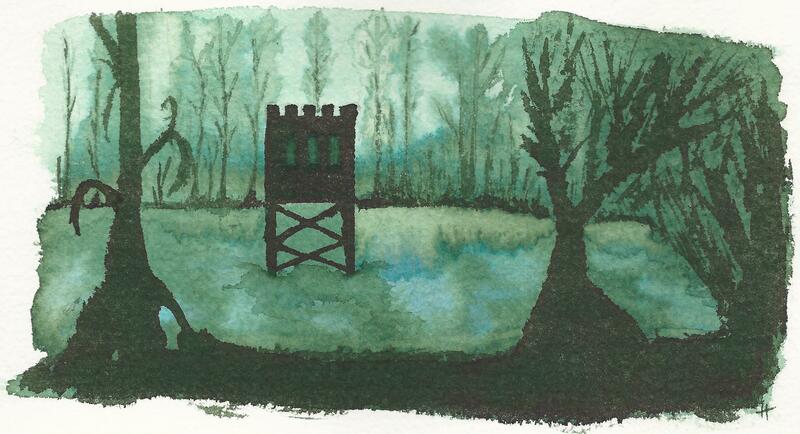 For the swamp lake, I used mildly water-diluted ink giving a darker green colour. The yellow/blue highlights were obtained by applying some bleach to the partly-dried ink. Olivine reacts really well with bleach, leaving a beautiful light-blue colour. For the foreground, the castle and the tree accents, I used pure Olivine, painted in with a small brush. The end result gives you a good idea of the colour span the ink is capable of in a more artistic setting. And it must be said, I'm very pleased with the drawing capabilities shown by this ink. 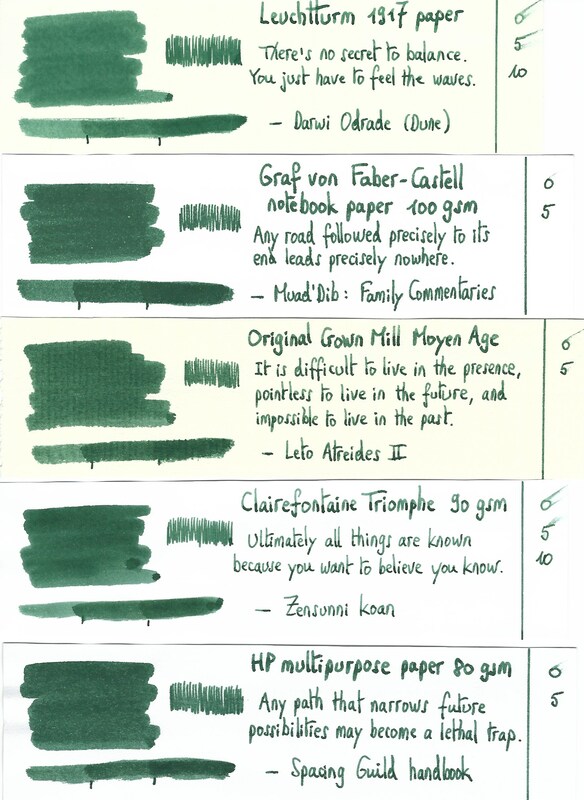 Olivine might not have been what you expected, but viewed objectively, this certainly is a very good ink. One that writes very smoothly and with beautiful shading. Personally, I also like the colour - the blue undertones add extra depth and complexity to what is in essence a dark-green colour. A pity this ink has zero water resistance. Finally, I was really impressed by the expressiveness of Olivine in a more artistic setting, the colour range that can be obtained is unbelievable! Overall, I'm glad I got myself a bottle of this ink. Nice review! I especially like your drawings and use of wider, drier normal nibs. These do demonstrate that the ink can be judged as not all that dark as most of the images in my review seem to appear. I myself prefer broad and wet nibs in general, and use of a (glass) dip pen for comparisons. Above all, your emphasis that Olivine is not a teal also sounds good. I too like this ink and, although it definitely isn't what a lot of us had been expecting, it still is a "good" ink. To repeat -- and to underline what several of us had already said -- even though it's not what we thought it would be, we might in fact still really like it... so... no reason not to buy it. Great review and I couldn't agree more with you, Lapis old pal. 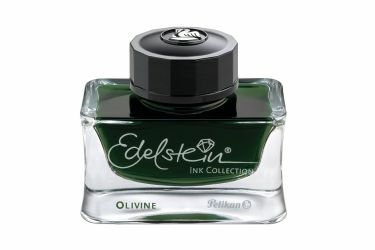 BUT it's still not what the Pelikan publicity seemed to have indicated and I would have preferred an 'olive' ink. Olivine is a good ink though and well behaved etc etc. ​Another excellent review, namrehsnoom. You have a wonderful ability, especially through the drawings, to make any ink look good, even those where the color doesn't appeal to me. I honestly didn't expect such a green shade for this ink, but will probably still buy a bottle. Thank you for such a great review! Both Lapis and this are very good reviews. Does any one have Herbin, Vert Empire? That was my first thought when I saw this ink. It shades, so is for me a must have..
...An expedition to town; commandeer a street car, chomp my way threw the Subway cookie jungle, a long walk of half a mile....then stopping off at a local water hole; afterward that trek. My B&M does have Diamine glitter inks. You have a wonderful ability, especially through the drawings, to make any ink look good, even those where the color doesn't appeal to me. Thank you ... I always try to look for hidden beauty. Often inks that are terrible for writing tend to work well when used in drawing. see below ... Vert Empire is a much greyer green. Edited by namrehsnoom, 16 April 2018 - 18:15. Thanks for the better view of Olivine and Vert Empire. Will call my B&M and reserve a bottle. Did. They are 140 years old this year. Now I have to think about buying a Spätburgunder scented wine colored ink, from one of Heidelberg's oldest vineyards...wonder if the wine comes with the ink. If they are going to make such a big deal of the vineyard, not having the matching wine would be a rip off. Probably have to age the wine a few years. Another DA ink, labeled and fancy boxed just for Knoblauch. Edited by Bo Bo Olson, 17 April 2018 - 09:35. I'm getting a twitch here. It's way too close to the color of my psychopath father's US Army uniform. Definitely a pass for me. Edited by Aquaria, 20 April 2018 - 14:10. Great review. Love your drawings! This color doesn't cover new territory and not much practical water resistance that I could see. 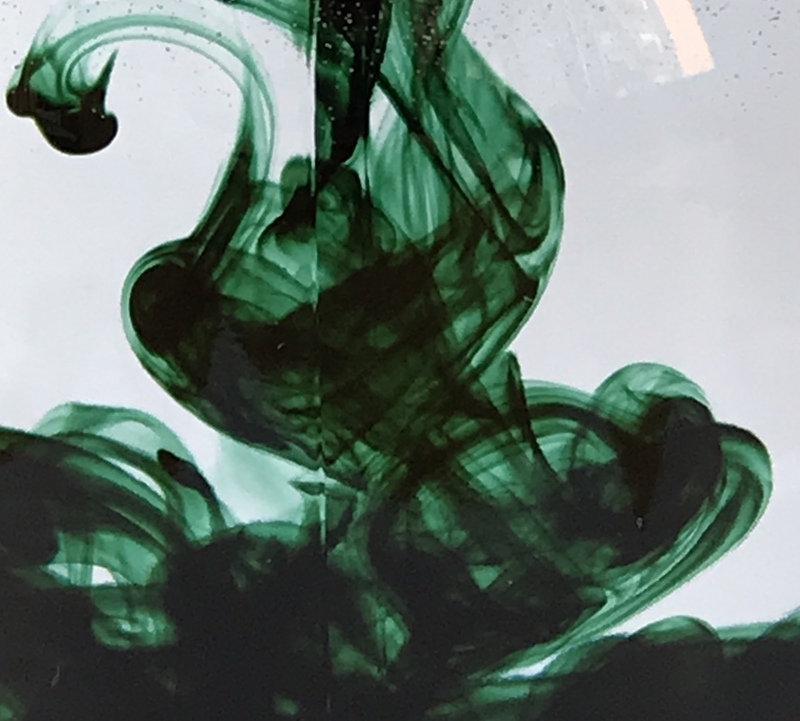 To a degree, this ink falls in the same general family as the Private Reserve Avocado (which you can recover after a spill) and many other greens in a similar shade. I had hoped for a green that is more yellow leaning. 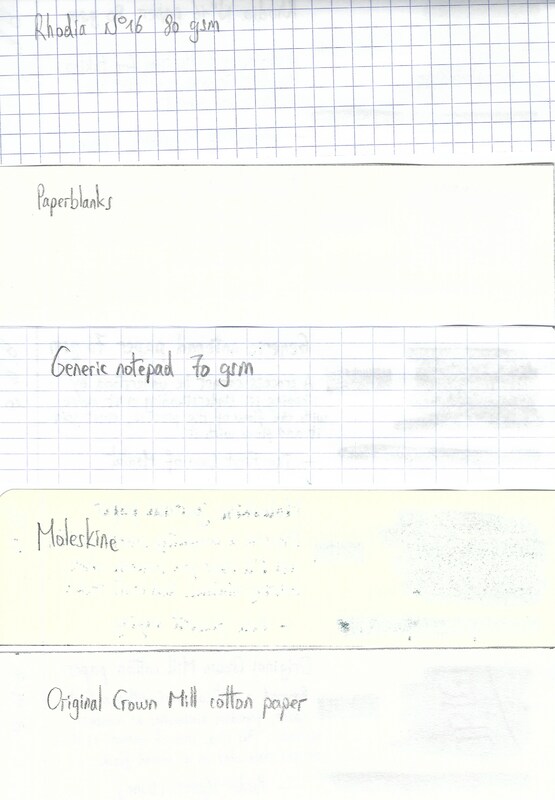 I tested lamy and 4001 BB on the same papers. Now testing Edelstein Olivine, and I'm going to be testing later the 4001 dark green also on these same papers, and GvFC Mossy Green. Same sort of testing, a semi-flex B/OB and a regular flex F/M. My feathering/woolly line system for papers and inks. F= feathering/woolly line. BEF....seen while sitting, Bare Eye Feathering/woolly line. …printer paper no matter what gramage. NEF, ....seen when holding the paper near the eye....OK ink and paper….not worth putting the paper in the printer…if one don’t have a good supply of better. MAGF....seen with the Honking Big Magnifying Glass. A good ink and paper....worth buying again. NoMAGF.....no feathering/woolly line with magnifying glass. Buy stock in the company, buy wholesale, smuggle it in.....both paper and ink. Then the Honking Big Magnifying Glass 2.7cm/ 1 14th inch thick three by 4 inch wide....8x11 cm. No, a 10 X loupe is too strong, every ink will fail. First, any paper that is both laser and ink jet is a compromise....so would expect a woolly line at least in the Ink Jet ink has to be quickly absorbed into the paper. Pure laser is better. The more rag one has is bad for feathering and woolly lines. 25% is fine, 50 or 100% is too absorbent and the clean line is lost; often feathering and woolly lines.......from other tests. Start with Southworth 90g/24 lb, Ivory Granite & Ivory Parchment….turns out to be sister papers, no big difference between granite and parchment. The only crème I could grab quick is Gmund 170g a near perfect paper...the same in 120**, is a bit more perfect. And M&K typewriter paper 95 g/ 25 1/2 pounds in white, with watermark. **(I do have a large scribble of the ink on both gramages; where I have some 14-17 green ink scribbles on those two papers, the Gmund 170&120g…. There was very little room on the best two or three papers, in I’d put 35-40 inks scribbles on the page….needed more inks than just the 14-17 greens. In fact the greens were the late comers. 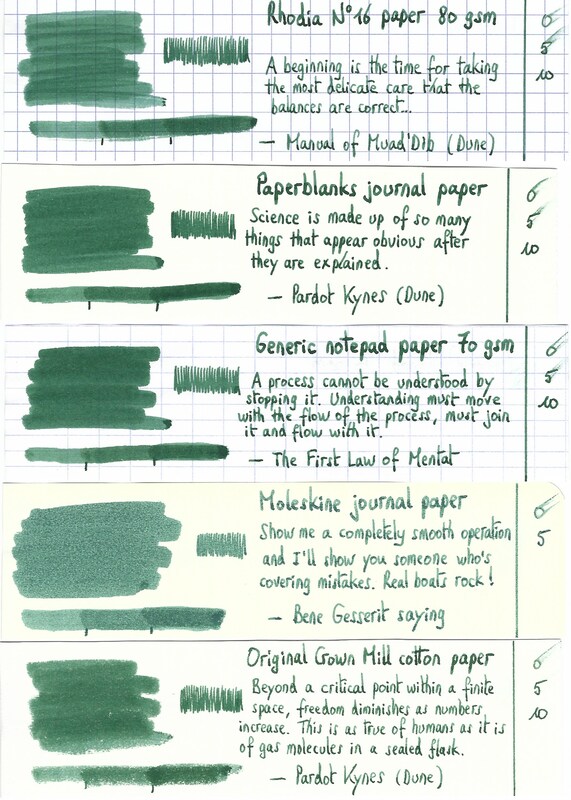 So I did get a good look at this greenish ink, compared to others and many more classic green. 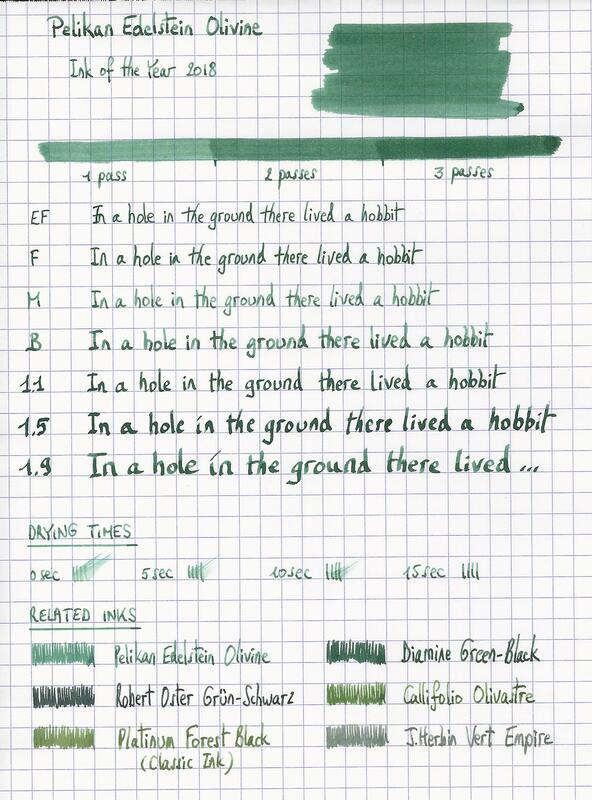 The 215’s regular flex M nib was a much lighter….still somewhat grayed as olive green compared to the green-green inks. The Semi-flex OB was dark, I guess the olive was slowly turning black. The regular flex Pelikan 215 M, looks pretty ‘olive’ to me…but there are first class greener olives and second class greenish olives in jars/cans and in the shop stands. (Could be also where the olive is from, Spain, Italy, and Turkey.) It looks more greenish olive than martini green olive. But will only take the honking big magnifying glass to the newer 170 sheet that now only has Lamy and Pelikan BB on it besides the Olivine. I’ve done a Geha 760 OB semi-flex …which as expected was darker than the regular flex M of my 215. As mentioned a very dark green in a wet semi-flex, hardly any olive. There was no feathering on any of the papers….there was tads of woolly lines. Not heavy woolly. Southworth Ivory Granite, a so so paper it now appears. NEF….no wooly line in the OB semi-flex nib, a slight tad in the M nib. Under glass… MagF there is a slight bit of woolly line with the OB, no more with the M than when just held near the eye. Not much shading, more in the semi-flex OB nib. 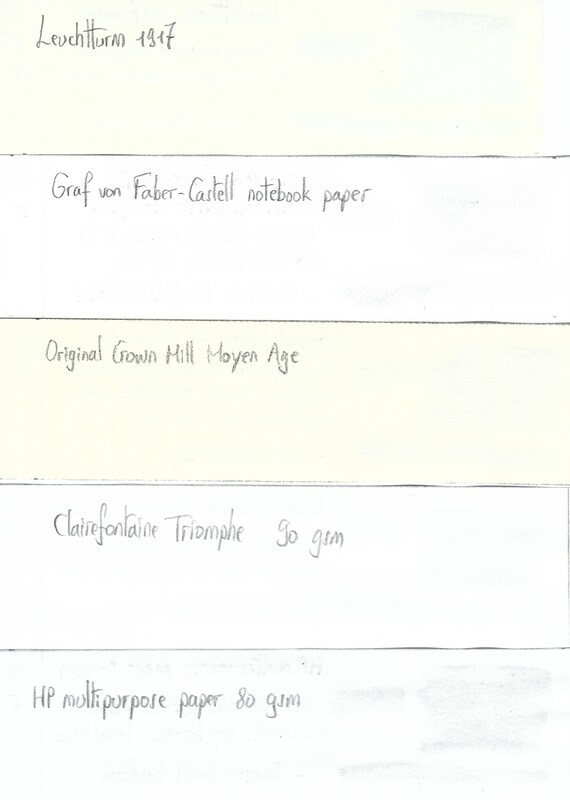 Southworth Ivory Parchment. A tad more woolly line, near eye and under glass very similar to its sister paper. A tad more under glass. The same for shading. Gmund 170 G, The semi-flex OB is a clean line, real good shading. The regular flex a good enough line, have to look hard to see touches of a woolly line on some letters. Takes the glass to get nit-picky. Not as much shading with the M, but some. Have a real slick white paper....Avery Zweckform 120 g glossy Laser paper. There is a color shift, perhaps more of the blue coming out…sort of blaa’s out a bit; more than just a bit. I like the color on the Gmund and M&K paper better. (even the Southworth papers too.) Both the semi-flex OB, and the regular flex M, have clean lines and good shading...a bit more with the wider wetter nib. That the wider wetter nib shaded better I’d not expected. Went from a self satisfied 'finally' 7-8 pens in the pen cups, to 15 on my way back to my 'normal' 17 inked pens. I wanted to use up some inks, and I can't do that if I have so many filled pens....they never get emptied out enough to impact an ink bottle. For my personal taste, amongst the 6 inks compared, the Pelikan is the ugliest (sorry to any potential fans out there). The gorgeous drawing flatters this ink immensely. We live in the Golden Age of Ink. In the last half a decade or so, more than six or seven new 'major' (at least for the ink addicted) ink companies have started to go with the 'traditional' 15, each with many shades of what ever one suddenly desires. Was better than I expected. 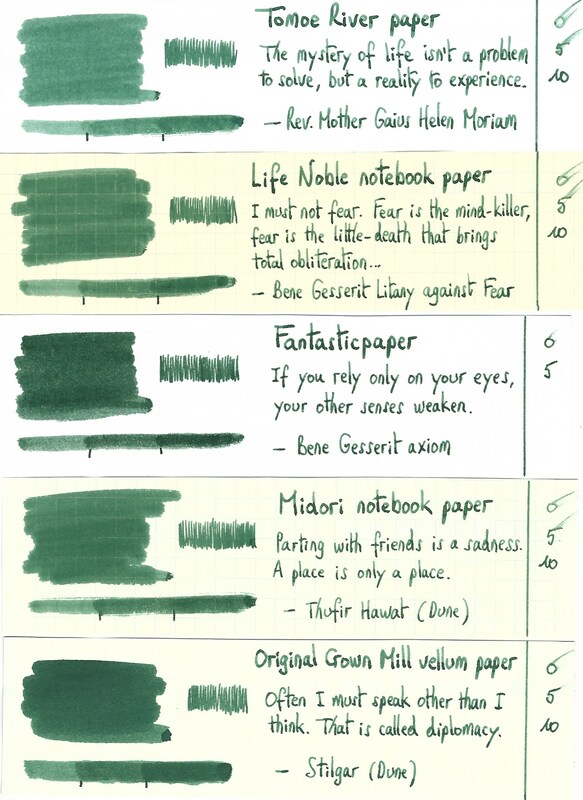 I can remember when murky inks, or murky shading inks were new to me; like the fabled MB Racing Green, was the most hated ink in the whole world.....then became beloved with in six months of being discontinued. (A 'noobie' believer, who was just getting into shading, and had no desire at all for murky.....missed Racing Green. After all, all I was going to do was buy a bottle of MB ink....just for the bottle and dump the ink. That was then the advice.) I got MB Sepia instead, in it was a brown ink, and I'd never used a brown ink..........OK, it's brown enough, even if a grand Sepia. There is a thread somewhere where a good poster took some 35 or so murky green inks I think it was, that is a great look. Since then I've opened my mind more to murky. Out side the wet semi-flex OB, I really don't see Olivine as murky. Took the words out of my mouth. Totally agree. Edited by BeckonRay, 23 April 2018 - 15:44. I can remember when murky inks, or murky shading inks were new to me; like the fabled MB Racing Green, was the most hated ink in the whole world.....then became beloved with in six months of being discontinued. (A 'noobie' believer, who was just getting into shading, and had no desire at all for murky.....missed Racing Green. Alas, the Montblanc Racing green is a mythical unicorn now. I was able to land a new old stock bottle from a generous owner of a store who parted with their own second bottle. I fall in and out of love with that ink. As with most inks, what pen/nib/ line-wetness etc you put it in matters. But when it works, its a magical concoction.